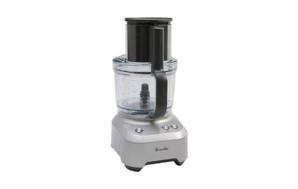 Snapshot: The Breville the Kitchen Wizz 11 BFP660SIL food processor has 1 speed, but no storage for attachments. How does it rate? Excellent at slicing carrots, chopping breadcrumbs, emulsifying mayonnaise and kneading pastry (with the processor blade). 3 chutes (large chute has a safety locking system). Very stable on the bench during processing. Processing blade is very sharp, care when handling. Continuous pressing of the pulse button can be annoying.